It’s not the sort of announcement you would expect towards the end of a match, but Truro City’s 3-1 ‘home’ loss against Torquay United was not your normal West Country derby. Truro have been groundsharing with the Gulls this season in National League South – the sixth tier of English football – after planning to redevelop their Treyew Road ground in Cornwall. They had been averaging fewer than 200 fans per game because of the two-hour trip from Cornwall to south Devon, with their lowest recorded attendance just 86 against Hemel Hempstead Town in October. But the bumper crowd on New Year’s Day more than doubled their season average of fans at their temporary home – they now average 425 per game. However, plans to build a supermarket on the site of their ground in Cornwall have stalled and the White Tigers are aiming to resume league games at their proper home soon, having already played an FA Trophy game back in Cornwall. But their planned return did not occur in time for the game against their landlords. While the the majority of the ‘away’ fans had a short trip home, supporters of the ‘hosts’ had a 100-mile journey across the Tamar river to Truro. On the field, Jared Lewington gave City an eighth-minute lead against the former English Football League side, who have gone top of National League South since former Bristol City and Cheltenham Town boss Gary Johnson took over as manager in September. 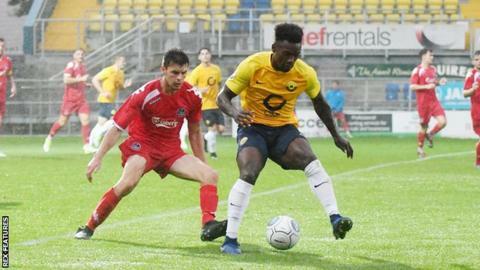 Torquay top-scorer Jamie Reid equalised on 21 minutes and put his side into the lead 13 minutes before full-time. Kalvin Kalala added a third three minutes from the end after Truro’s ex-Gulls winger Niall Thompson was sent off for two yellow cards. “We always had the extra quality on the pitch,” Johnson told BBC Radio Devon. “I’m very pleased with the performance of the lads because they had to be men, because to be fair to Truro they really competed.